US-EU trade talks set to open amid tensions. Tensions over spying and protected industries will be the backdrop of talks aimed at creating the world’s largest free trade zone between the European Union and the US. The US has caused friction with its allies due to the snooping carried out by the National Security Agency. 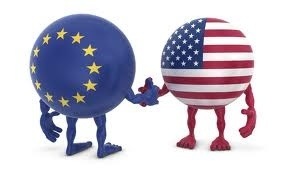 The US and the EU officially agreed to open talks at the Group of Eight conference last month. Their aim is to remove trade and investment barriers between the two sides. There are already comparatively few direct tariffs on goods and services, but there are other obstacles to remove such as regulatory and safety standards, inspection procedures, and preferences for domestic business. If these hurdles are eliminated, the costs for companies doing transatlantic business could be significantly reduced. European negotiators will be pushing for US states, cities and federal departments to abandon preferences for American contractors, while Washington will be looking for the EU to open up its market to US biotechnology firms wanting to sell products like genetically-modified foods, something which remains controversial in Europe. Head of the European Commission Jose Manuel Barroso said that the negotiations would not always be easy but they would be worth it. Last year, trade in goods between the United States and the EU was worth some €500bn euros, with another €280bn euros in services and trillions in investment flows.